As collaboration technology has become an essential vehicle through which enterprises do business, the need for treating it as more than a tool is apparent. There’s no argument that when examining specific solutions, tech managers must look at platforms, software, and devices; but before getting down to the nitty gritty, they should start to consider collaboration as a core part of their organization’s infrastructure. At least that’s what David Kung believes. As vice president of product strategy at Oblong Industries Inc., the Los Angeles, California-based developer behind the 3D visual collaboration platform Mezzanine, he notes that the declining cost of pixels in general enables companies to provide more collaborative displays to their employees, which, in turn, requires more strategic consideration on how to integrate them into a facility. “I hope that folks in IT start thinking about displays as part of their infrastructure,” he said. “I think displays need to be thought of as part of the core fabric of the enterprise. If you’re positioning technology for your enterprise, of course you’re thinking, ‘I’ve got to enable Wi-Fi, I’ve got to enable user devices, whether it’s laptops or desktops.’ You're thinking about printers as a commonly accessible utility. And I think displays are going to become more and more part of it.” In other words, they’re not just screens that you slap up on whatever wall space you happen to come across, but part of a thoughtful design whose goal is to enable meaningful work. InFocus’ Mondopad is an all-in-one collaboration system for videoconferencing, data sharing, and whiteboarding. The Mondopad Ultra, which features a 70-inch display, delivers 4K resolution in combination with projected capacitative touch capabilities. Glenn Jystad, director of product marketing at InFocus, notes that both the Mondopad and the Mondopad Ultra allow professionals to be more productive, no matter where they happen to be. “With more and more employees working remotely and smart technology allowing their teams to become more global, there is a definite need for organizations to offer smart collaborative technology and videoconferencing solutions for their local and remote teams to be connected and working efficiently,” he said. Barco expanded its ClickShare wireless presentation portfolio to include the CS-100 and CSE-200. Designed for huddle spaces and small meeting rooms, the CS-100 is a standalone unit equipped with an HDMI output, and allows up to eight participants to connect, with one person presenting at a time via the ClickShare button or the ClickShare app. The CSE-200 was built for enterprise rollouts requiring enhanced security, and it features more connectivity options (including AirPlay), as well as central management. With this unit, two users can screen share simultaneously. Another new product, the CSE-800, was designed to bring the ClickShare experience to boardrooms, high-end meeting rooms, and conference rooms. Introducing a number of unique features, including simultaneous sharing of up to 8 people, automatic & manual moderation, and blackboarding & annotation, the CSE-800 is the most powerful system in the ClickShare family today with two HDMI inputs and outputs. Two 4K UHD displays can be driven by a single base unit. The two network connections also allow separate and simultaneous connection to multiple networks (e.g. guest and corporate), and provide additional security. Devio, Biamp’s single-box offering for huddle rooms and small meeting rooms, was designed to provide professionals with a quick way to connect and get down to work. Participants connect via the system’s CR-1 connection device to share content locally, and they can use their preferred software codec––be it Skype for Business, GoToMeeting, WebEx, or others. DisplayLink USB graphics technology is embedded into Devio, enabling the system to send and receive audio and video over USB, as well as extend the computer desktop to two displays (provided that DisplayLink graphics tech is installed on the end user’s computer).The system comes bundled with the DTM-1 beamforming microphone, which provides 360-degree coverage, and acoustic echo cancellation and noise reduction functionality is built in to ensure optimum audio quality. Yamaha’s Revolabs addresses organizations that don’t wish to invest in dedicated equipment for conference and huddle rooms with the YVC-300, a portable USB and Bluetooth conference phone. The phone is designed to accommodate four to six users, and will connect to PC-based audio, video, and web conferencing clients via USB. With the YVC-300, smartphones and tablets may also act as conference phones: when connected via Bluetooth, they serve as both microphone and speaker. The phone incorporates Yamaha sound processing technology, such as adaptive echo cancellation, background noise reduction, and voice activity detection. The latest addition to Kramer’s VIA wireless presentation and collaboration solutions line is the VIA GO, designed for huddle rooms and small meeting spaces. Meeting participants may connect from PCs and MacBooks, as well as Android, iOS, and Chromebook devices. Two user screens may be shown on one single display at a time. The system can be controlled and managed on internal networks, and guests may use it as a wireless access point. Mirroring is possible for iOS (MacBook, iPad, and iPhone), Lollipop OS 5.0 or newer, and Chromebook devices. The Prysm Visual Workplace, developed by Prysm, now incorporates Live Source Streaming. The new feature allows all meeting participants to manipulate all live sources displayed, regardless of their location, or the device they happen to be using. Users may also share content in a number of ways, including via laptops, mobile devices, PCs, videoconferencing systems, Apple TV, and document and security cameras. Along with Live Source Streaming, Prysm has introduced Quick Start, a function that allows those without a Prysm account to connect to Prysm Visual Workplace and access a number of its features. This feature can be used in combination with Wireless Screen Sharing, which enables the wireless display of laptops, tablets, and smartphones to a Prysm display. InstaShow WDC10, a plug-and-play presentation system that wirelessly connects a user’s computer to a central display or projector. With the touch of a button, the meeting collaboration system allows up to eight participants to instantly share their laptop or device screen in brilliant full HD quality, making collaboration more dynamic, productive and engaging. The InstaShow WDC10 is compatible with all operating systems and any display with an HDMI port including BenQ’s projectors, interactive flat panels and monitors, making it an ideal presentation solution for any meeting room or collaboration space. It features excellent image quality in full HD and fast transfer time via WLAN standard 802.11ac support that ensures absolutely smooth wireless streaming without lag or buffering. It only requires simple HDMIand USB 3.0 connections to the user’s device and the screen. There are no additional hardware or software requirements, providing simple, fast deployment into any space, streamlining the meeting experience. Ricoh offering a new solution that embraces the diverse nature of collaborative efforts that drive the new world of work. The RICOH Unified Communication System P3500M builds on the successes of its predecessors to enable collaboration and communication between this portable, all-in-one system and any WebRTC-compatible platform. Using the P3500M, organizations can achieve new levels of collaboration. 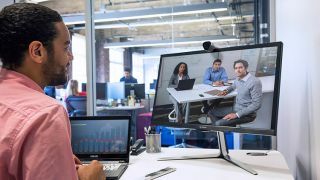 Employees can connect and collaborate with colleagues, customers and partners on the road or around the world, via real-time HD video and audio, and screen sharing, regardless of which WebRTC-supportive system they are using. wePresent’s WiCS-2100, launched recently at ISE in Amsterdam, is designed to facilitate collaboration in any environment. As with all wePresent products, the WiCS-2100 supports most major platforms for computers and mobile devices, including enhanced compatibility with Apple AirPlay and integrated Google Chromecast support. wePresent’s Management Suite, another new offering, is a server-based utility that allows network-integrated management of wePresent hardware. Once installed, the Management Suite will allow administrators to schedule firmware updates, change the configuration of individual units, or remotely troubleshoot problems with the hardware. Best suited for large networks, such as schools or office buildings, the Management Suite is intended to address the growing need for remote hardware management, easing the workload of IT administrators who oversee an abundance of devices. The WM307i model is the latest addition to the Nureva Span visual collaboration product line, featuring a full-HD 1080p solid-state, interactive projector. Combined with a customer-supplied PC, the WM307i creates a 7-foot (2.13 m) wide interactive digital wall. For groups that need more visual space, up to four systems can be seamlessly linked to create an ultra-wide workspace (28' or 8.53 m). The WM307i complements the existing line of Span systems, which includes the 10-foot, 2-inch (3.10 m) wide WM210i and the 6-foot, 2-inch (1.88 m) wide MC306i mobile system. Like these systems, the WM307i is purpose-built for Span software, which supports design thinking, agile workflow visualization, corporate training and other activities by groups that need to be immersed in visual information. Vaddio has made a name for itself by providing best-in-class PTZ. The company has expanded their portfolio yet again with the addition of the ConferenceSHOT AV Enterprise Class Conferencing System. Good for huddle rooms and small- to medium-sized conference rooms, the ConferenceSHOT AV sets new price performance standards for USB-based enterprise-class conferencing systems. The solution integrates a 10X zoom PTZ camera and audio conferencing mixer into a single USB 3.0 device, so tech managers can easily connect up to two microphones and an external speaker directly to the camera. It allows plug-and-play functionality with all major UCC soft clients such as WebEx, Skype for Business, and Google. Carolyn Heinze is a regular contributor to AV Technology.